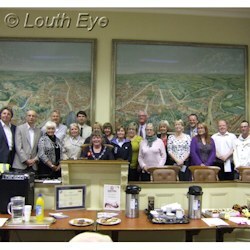 On Tuesday, May 14th the annual Louth town meeting took place at Sessions House. This is unlike a regular council meeting, in that the councillors attend as parishioners, and it's more of an annual report of how well the town council has done. The council achieved 84% attendance this year, slightly down on the previous year, with three councillors making 100% attendance (Councillors Sue Locking, Roger Featherstone, and David Hall). However the outgoing Mayor, Jill Makinson-Sanders, was keen to stress that the town council is "a completely voluntary organisation." This is in response to complaints about town councillors getting large allowances (which they don't). "To read that people are getting huge allowances makes me extremely angry," the Mayor said. The meeting included a recap of the past year's council activities, and it was followed by updates from the Louth Town Partnership, Zero Degrees, and Louth in Bloom. Jeremy Gale gave an upbeat report of Louth Town Partnership's activities and plans for the future. This group is involved in promoting the town by organising festivals such as the Christmas Craft Fair, the Victorian Fayre, and and a new Vintage Day. They also hang the bunting up in the centre of town, which will be up again in about a month. Their magazine, Love Louth, "attracted more advertising than was anticipated," according to Mr Gale, and this is good news because it's one of the ways the organisation is moving towards financial independence. The partnership is in the process of building a database of local businesses. However at the end of September Sam Phillips, who has been running the magazine and organising events, will go back to ELDC. That will leave the partnership in need of a full-time town manager, which is a relatively expensive post to fill. "This will be our biggest outlay," Mr Gale said. Alan Mumby and Nicky Jarvis also gave an enthusiastic presentation about Zero Degrees. This festival starts on June 21st, and will last for three weeks. The 2013 event will include a new comedy element, as well as incorporating the usual food, music and art festivals. "This festival has not had lots of money thrown at it," Alan Mumby said. He explained that the Co-op had sponsored the Vintage Day to the tune of �800, whilst other aspects were funded in part by the participants. Councillor James Pocklington gave an update on this year's efforts for Louth In Bloom. There are plans to double the number of hanging baskets in the town. There will be a Festival of the Bees in May, including a family fun day at Spout Yard Park on the 18th, and a bee-themed art exhibition at McKinnells Studio in Vickers Lane from 18th-23rd of May. The theme of Louth in Bloom this year is edible gardening. The Sessions House was also decorated with knitted bee and flower decorations, which will be something to look out for during this festival. 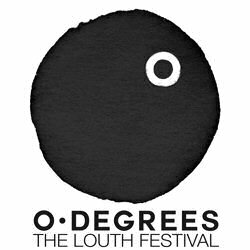 These three festival-based presentations seem very exciting, but when the floor was opened to the public there were a couple of major issues raised that will present huge challenges and potential conflicts for Louth. Councillor George Horton spoke about the proposed development of 970 houses off Legbourne Road. Plans for this development were on display on the 8th and 9th of May at the town hall, and they are huge in scope. Councillor Horton called for a public meeting to discuss them in more detail. "People are really worried about their homes and valuations," he said. "Something like this could be the death of Louth." The recent rise in parking charges also came up for criticism. Councillor Margaret Ottaway said "People of Louth need to email ELDC and ask them if they want to kill the town with these prices for parking." "We're going to lose a lot of trade in Louth," Councillor Sue Locking said. Jackie Featherstone was also very angry about the charges, saying "It's a blight to everybody. This is people's lives and I think something does need to be done about it." She warned that Louth risked becoming a "ghost town." Finally, the Mayor congratulated a number of people and organisations and presented them with cheques from the Mayor's Charity Fund. The recipients were the Citizen's Advice Bureau, Run For Life, Spout Yard Management Trust, Housing Support Solutions, Kidgate Primary Academy (for their choir), Nichols, the Hubbards Hills Trust, Louth and District Concert Society, the In Bloom Group, Louth and District Scout Council, and Louth Division of Guiding.